Josh D. Weiss/The Red & Black Jane Russell poses outside the Ramsey Center, where she soon will retire as director of recreational sports. 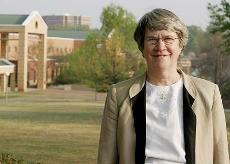 In her 32 years at the University, she supervised the creation of the Rec Sports department and the Ramsey Center. Taking a break from posting stuff from last weekend’s shoot in Walton, here is the first picture of mine in awhile to run in the Red & Black. This is Jane Russell and she’s been with the university’s recreational sports department for a really long time. I really like how the lighting turned out in this photo, a lot of which has to do with shooting it at 8:30 am when the sun was still kind of rising. If I could shoot it again, I’d have changed my angle a bit to get more of the Ramsey Center behind her, and I’d have asked her to cross her arms. It feels very boring, and I think having her arms crossed would add a little body language to the shot that is just missing. Posted in Portraits, Red & BlackTagged athens, georgia, ramsey student center, university of georgiaBookmark the permalink.